We always love shouting about our wonderful team here at Creamline. As part of our Best of Local range, we handpick our favourite producers who are passionate about what they do, and Cocoa Cabana are no exception! Sarah Gallacher opened her chocolatier in West Didsbury back in 2012, after training at the world-famous Slattery’s Patissier and Chocolatiers. These days though, she focuses on her own creations, using premium locally-sourced ingredients and no additives, preservatives or artificial flavourings. The award-winning artisan chocolatier can count accolades including the Guild of Fine Foods Taste of Gold Award! Medium Chocolate Egg – a beautiful handcrafted egg, with four melt-in-the-mouth truffles included! Large Chocolate Egg – the ultimate Easter gift for a chocolate lover! 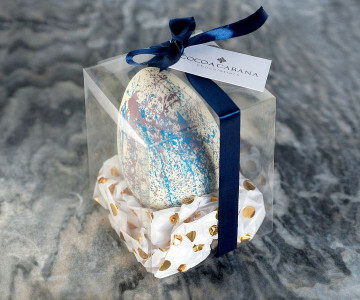 This artisan egg comes with six truffles, hand made by the expert chocolatier. Easter Mini Egg Lolly – the perfect sweet treat for little ones. With delicious mini eggs and beautifully smooth white chocolate. All of Cocoa Cabana’s chocolate creations have been hand-tempered, and the ingredients hand-selected from artisan suppliers. You can also browse their luxury assorted chocolates in our Deli range here. Don’t forget that all of the products in our Best of Local range are available for free, next-day delivery. Simply place your order before 5pm and we’ll deliver it straight to your door.